I made this one when I was still at school and still experimenting with the Batik process. The lacy wings of dragonflies work so well using the cracking of the wax to show the veins on the wings. This rather crude early piece was on my mum's kitchen wall till she died in 2010. Although stained from the years without protective glass, my daughter Scarlett took it lovingly home to put on her own kitchen wall. When I set up the '50 Years of Batik' exhibition in 2016, I asked if I could 'borrow' it back for the exhibition. The exhibition was such a success that I kept it as a permanent exhibition in my Gallery. It plays an important role showing how my work has developed - and I don't think poor Scarlett is going to get it back for a while yet! 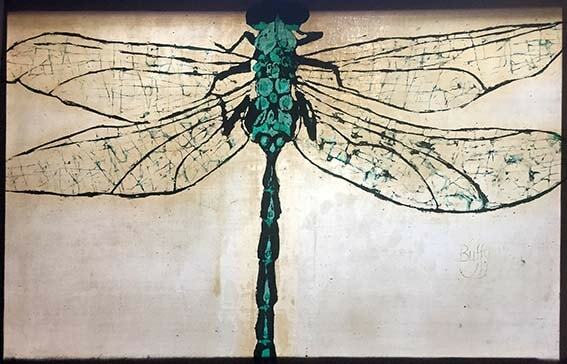 I still often include dragonflies in my work today.